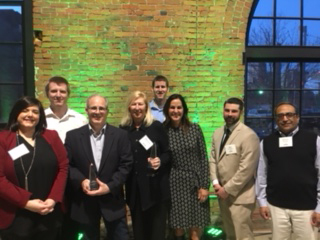 HURON, Ohio--(BUSINESS WIRE)--Ohio-based edtech company, n2y, won two categories at the OHTec 12th annual Best of Tech Awards. n2y, a pioneer in effective special education, was named the “Best Use of Tech for Social Good” and the “Best Tech Team.” These awards add to a stream of industry recognition that n2y has received over the past quarter, including EdTech Digest and a BESSIE that showcase the most effective and innovative technology offerings. “n2y’s highly talented tech department designs and builds creative and innovative solutions for both its external and internal customers. The team is grateful for the recognition that comes with OHTec's ‘Tech Department of the Year’ award,” stated Steve Lubowicz, n2y’s Chief Technology Officer. OHTec is a technology industry advocate and support resource within the Greater Cleveland Partnership, that focuses on building relationships and a strong technology industry within Northeast Ohio. As a voice for the technology community, OHTec’s goal is to ensure a high level of engagement among the companies and individuals in the industry. More than 220 tech leaders from across Northeast Ohio gathered last week to celebrate the highest performing and most innovative technology companies in Greater Cleveland. n2y® is changing the way special education is taught by enabling students with special needs access to the general education curriculum through its award-winning curriculum, Unique Learning System® and with News-2-You®, a weekly current events newspaper where students are engaged with current and relevant news. SymbolStix PRIME®, a symbol database and creation platform, and newly-launched L3 Skills™ deliver resources specifically designed for learners outside the general education spectrum. With age-appropriate learning solutions, n2y is committed to impacting and advancing the lives of individuals with special needs. With n2y solutions, everyone can learn. For more information, visit n2y.com.